Sorry, the in-page video player requires Internet Explorer. You can download the video using the "Download" links provided below. TRADITIONAL NAMES: Koka (RR); Other Polynesian - Koka / Tongotongo (FIJ), Koka (TON), ‘O‘a (SAM); COMMENT: Rarotonga: a new name emerging 2000 was Nato. KEY FEATURES: A semi-deciduous, spreading tree to 25m. LEAVES terminal clusters, alternate, glossy green, compound with 3 leaflets. LEAFLETS oval, to 15x10cm, edge with low teeth, central stalklet notably longer than laterals. 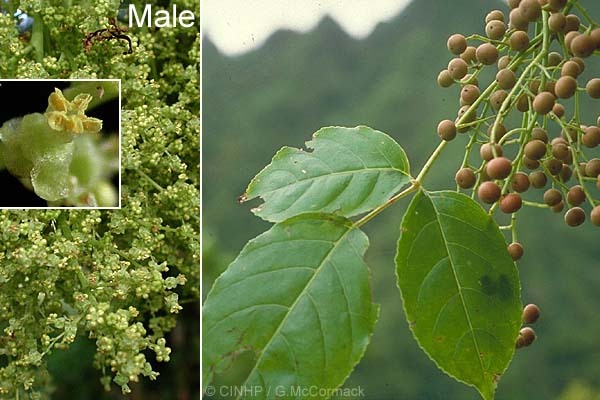 FLOWERS - male & female trees separate; terminal, minute, green; male clusters dense to 20cmØ; female clusters simpler. FRUIT: open clusters; brown, spherical, to 1cmØ. SIMILAR SPECIES: Allophyllus timoriensis has compound leaves with 3-leaflets, but stalklets are all short (vs central much longer); fruits oval and ripen bright red (vs. round and brown). TAXONOMY: PLANTAE; ANTHOPHYTA (=Angiospermae); MAGNOLIOPSIDA (=Dicotyledones); ROSIDAE; Euphorbiales; EUPHORBIACEAE. COMMENT: Named after G.W.Bischoff, with an original latinisation as Bischofia, not Bischoffia. This monotypic genus is here kept in EUPHORBIACEAE, while others put it in its own family BISCHOFIACEAE and place this in the order Sapindales. POSITIVE SIGNIFICANCE: Medicine, Material (Dye). Comments: Used in Samoa and Tonga to make a dye for tapa cloth, this use is not recorded in the Cook Islands. Seeds are used as ammunition in peashooters. The fruits are used medicinally (Whistler 1990). Makes hard and durable posts. Timber similar to Mahogany - red and easily worked, though vulnerable to attack by borer. GENERAL NOTE: The eastern limit of this species as an indigenous tree is difficult to determine, but presumably at least to Fiji, Samoa and Tonga; Cook Islands and Societies indigenous or Polynesian introduction; Hawaii a recent introduction (AC. Smith, Flora of Fiji). Gives hard and durable posts; and in Tonga and Samoa the bark is used to make a red-brown dye commonly used on tapa [AC Smith].